Today we went on a day long tour to Naples & Pompeii which is a two hour drive from Rome.Our tour guide picks us up and takes us to meet the group. We load up on a bus at 7:30 am and off we go. We are immediately humbled by our ignorant American status when we realize the tour guides all speak a minimum of 3 languages. One of the guides (we had 3 in total during the course of the tour) spoke English, Italian, Spanish and Japanese. It was just downright embarrassing. Most everyone on the bus spoke at least their native language and English - "ugly Americans." We ought to be ashamed that we barely can speak 1 language....Anyway...I digress. The tour bus takes highway A1, known as the Highway of the Sun that parallels the Appennino Mountains - also known as "The Backbone of Italy." The ride was very scenic and green. Seemed as if every home had its own garden of grapes, oranges and olives. Two hours later we arrived in Naples - City of the Arts and a major port. We were a tad deceived about the tour. I thought we would be able to walk around Naples a bit before we went on to Pompeii...NOT...a quick drive through as the guide pointed out some major landmarks and we watched the Napoli Marathon. Then we were off to Pompeii. We stopped on the way in Torre de Grecco and learned how Cameos are really made. They are made from shells from the sea, mostly Conch shell. We watched on of the artists work on a new cameo and then went into the display area. The craftsmanship was superb. Sandy was eyeing the most expensive pieces in the cases, but after doing the conversion, we decided we could not part with 5000euros = $7000+ US Dollars. I did find a beautiful miniature cameo outlined in gold filigree to put on my charm bracelet at a significantly more reasonable price. 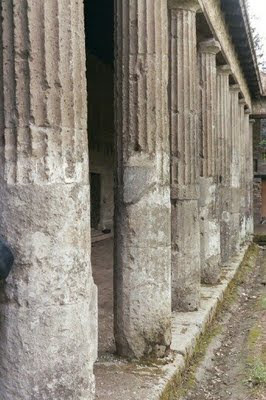 We moved on to Pompeii where we stopped for lunch first. The minestrone soup was excellent yet different. Clear broth, not red. The spaghetti was good but the sauce tasted kinda like spaghetti-O's. The veal was fantastic. We were partnered up with a 28 year old Australian girl named Maria Schiavello, traveling alone on "holiday" for 8 months around Europe. Mom and I were impressed with her tenacity. Next we took a two hour walk through the excavated city of Pompeii. It is huge - 65 acres of which only 45 have been excavated. Excavation officially started in 1748, almost 150 years after Pompeii was rediscovered in 1600. Pompeii was buried under the ash from the eruption of Mount Vezuvio on 24 August 79AD. them to eat as if you are eating a hunk of watermelon. Wish I could upload these pictures. Another 2 hour bus ride and mom and I were back in Romearound 8:30 pm. We visited the bar - AGAIN - and had a nightcap and snack. Tomorrow we have a tour of the Vatican and Sistine Chapel followed by wandering around and a dinner cruise.